If you update Microsoft’s OneDrive app for Android on Thursday, you’ll notice one key addition: you can now upload files to your OneDrive for Business account. The app is the first OneDrive app published by Microsoft to allow users to upload files to either account—provided you have one, of course. Microsoft provides OneDrive for Business accounts to corporations which subscribe to its Office 365 software services. As of June, those subscribers receive a free terabyte of cloud storage to use as they will. Microsoft also has published a OneDrive for Business app for iOS, but that app currently can only access the business account, a spokeswoman for the company said via email. In the last few years, Microsoft has begun embracing the BYOD (Bring Your Own Device) movement that has already elevated iPads and Android phones into business tools. As it has done so, Microsoft chief executives Steve Ballmer and Satya Nadella have ordered Microsoft developers to begin building out their services for other platforms, sometimes even before those functions appear on Windows. But on Windows and its related mobile devices, Microsoft has been careful to separate work and business data—a focus that Android, especially, has neglected. In keeping with that, users won’t be able to transfer files from OneDrive for Business to a personal OneDrive account. Users, however, will be able to “switch easily between the two,” the spokeswoman said. 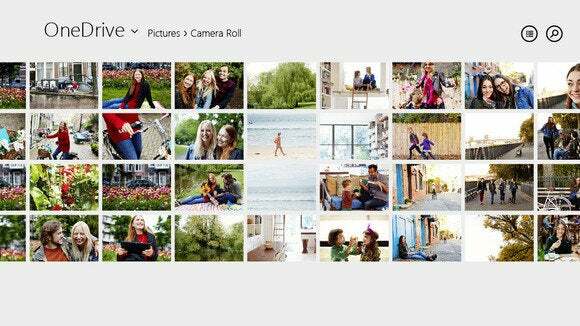 Likewise, users will only be able to automatically upload photos from the Android camera to the personal OneDrive account, she added. Microsoft has done a good job integrating OneDrive into its various services, although rivals, including Google and Box, have pushed ahead into unlimited storage plans. Microsoft has yet to make that leap. Until it does, however, it has been busy making its apps as useful as possible. Eventually, those same capabilities will come to Windows as well.